Nexx’s new flip-front helmet is double homologated, meaning it can be legally used on the bike in both the open and the closed positions. It has an shell made from X-Matrix (a combination of fiberglass, organic fibres, aramid fibres and carbon) or pure carbon, and comes in three shell sizes for optimum fit. The inner lining is anti-sweat and anti-allergenic and is removable and washable and the cheek pads use Morfofit ergonomic fitting. 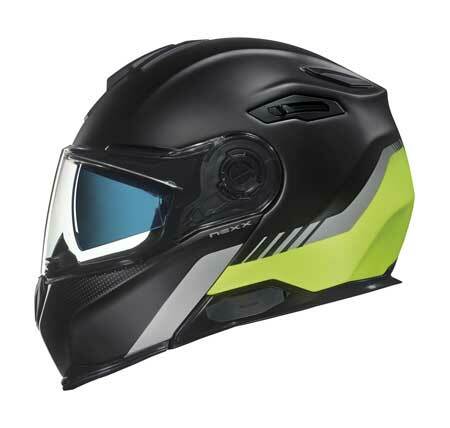 There’s a button-operated drop-down visor, plus the main Lexan visor is lockable and has provision for fitting a Pinlock. 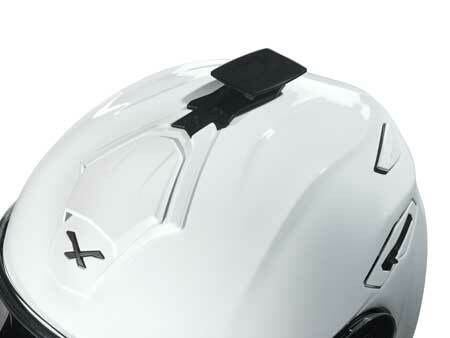 An unusual feature is the included removable brackets to fit an action camera to either the top or side of the helmet. Another tech feature is that it comes ready to take an X.Comm2 plug ’n’ play intercom system. Available in sizes XXS to XXXL, the X.Vilitur weighs in at approx 1675g for the medium and retails for £369.99 for plain, £399.99 for graphics or £499.99 for carbon.